I must therefore admit to being quietly shocked when at the CIPD’s HRD12 conference in London last week, Sue Round, Director of L&D for British Gas, opened her presentation with a slide that is most easily summed up as geopolitical context. She cited in her context the Arab spring and the ensuing ‘end of deference’, the rise of China as a global economy and the move from West to East and quoted President Obama’s line that America was “leading from behind”. She used this to signpost the significant change that is happening globally at present. I may have missed the segue but it felt quite a bump back down to the smaller picture to then be discussing management development, 70/20/10 learning and the 9-box model. All valid stuff and reassuring to people like me that what we are doing is in line with ‘the big boys’. However, in reflecting on the session it did strike me as odd that this context was presented and not explored – but then it’s ‘only’ L&D surely? I am not one to diminish what we try and do in organisations (there’s enough people doing that for me) and anyone who knows me will attest to the fact that my ego is alive and well but when it comes down to it surely what we about is developing knowledge, skills and behaviours in the context of the organisational strategy? That could be as simple as improving excel skills or as complex as supporting to next generation of leaders in developing themselves but it’s unless you are defining L&D strategy for the UN it is unlikely the geopolitical drivers discussed here are going to be making any kind of appearance in your 12/13 objectives. Without doubt there are some amongst us who will face the challenges presented by say the shift of power and labour from West to East but it will be driven by organisation level decisions to react to those changes and not from L&D in my opinion. At the end of the day L&D is there to increase the capability of the organisation to deliver its strategic goals and surely this is about returning value to the shareholder (or stakeholder) and to anyone outside L&D that is all about pounds, shilling and pence? Or maybe there’s another perspective on value….but more about that tomorrow! For those of you who worry that it’s actually the Illuminati that are secretly running the world you can relax and take a breath. It’s actually the Welsh who are secretly running the world and if further proof were needed it arrived at HRD12 in the form of Nigel Jeremy, Head of Organisational Development for Marks & Spencers (native of Neath). Unless managers are accountable for outcomes you won’t get traction. For example at M&S anyone who manages more than 5 people gets a personalised cut of the employee survey with their results. What came through very strongly was how astute you need to be to deliver this kind of role in a large organisation. The acknowledgement that senior stakeholders will have different points of view and you need to adapt how you manage them dependant on their pre-existing views and for those that ‘don’t get it’ they will never get it but you need to work hard to get grudging acceptance (I know that feeling well!!) in Nigel’s words “be patient and sell on success”. He ended with his view that OD is a system of connected processes that will be different for every organisation and you need to plan your approach with the organisational context and how/who you will influence to get the necessary buy in and his final line was that OD was “a casserole not a sandwich”. Over the previous 12 months I had watched several friends and contacts taking centre stage at various events within the HR community. Those I saw did very well at presenting a view of the broad people professional as someone who is not insular, short termist or reluctant to challenge the received wisdom. It was great to see them come off stage like conquering heroes feeling they had ‘nailed it’ and done what they could to develop thinking in our profession, enhanced both their personal reputations of and that of their organisations and delivered a good session. The Friday before HRD12 I received an e-mail from Greg Styger, one of the conference team at CIPD, inviting me to part of a break out session along with Sukh Pabial and Doug Shaw, discussing social media and learning. I of course said yes and started to think about how I would present my views. Then, about 36 hours before the event, I received a slightly more urgent e-mail from Sara Gilmore also from the CIPD conference team asking me to be part of a panel in the main conference. The topic? Social Media and Learning. I think what followed was a relatively successful session. The main reason for the success was undoubtedly Perry Timms, the Head of OD for The Big Lottery Fund. For those of you who don’t know Perry I am stunned as he is the most networked man on the planet. He did a great pre-game session with the 3 panelists and once the ‘curtain’ went up showed his smarts as a facilitator ensuring the session ticked along rather than acting as a rather superfluous chairmen as I had seen others doing. The two fellow panelists were from Save the Children and the RAF and it was interesting comparing a global third sector organisation with a public sector organisation that is contracting. Rather than document the session I will point you to this post that Sukh wrote live from the session. The two things that have stuck with me since the session? The weird sensation of being involved in a session that people are tweeting about and stepping off the platform to see feedback that has gone on through the session. The latter was the sense that whilst L&D professionals are slowly but surely becoming advocates of social learning (seemingly at the expense of e-learning which got a slating in the session) it shocks me how many are advocating something they’ve not really experienced and have a limited understanding of. It strikes me that building enthusiasm through individuals (as Save the Children brilliantly demonstrated) makes any influencing you need to do at organisational level far easier. I said it at the time and will say it again here now – if you want to be able to advocate something in your organisation then first hand knowledge and genuine enthusiasm will make a much more powerful statement than the feedback from a conference session! You have to be in it to win it! But at least that’s another thing from the 2012 list ticked off! I managed to get asked a question on social media policies. As I did during the session I would point anyone asking the question to this post by Neil Morrison who makes the argument far better than I would! Wednesday saw me attending (and taking part in) the CIPD’s HRD conference held in London’s Olympia. I owe thanks to Johanna Ratcliffe and the team for my ‘blogger blogger’ invite and the opportunity to enjoy some really interesting sessions. Some of the blogging contingent (Sukh Pabial and Doug Shaw) took a ‘live blogging’ approach to the event but I warn you now the HRD theme will run for about a week as I ‘ruminate and cogitate’ over what I saw, heard and have thought about since. If you remember back to September 2007 the words austerity and credit crunch were nowhere near the venacular but in a few days the wheels came off the economic wagon and what has been a very ‘interesting’ few years began. The first really big milestone was the first run on a British bank for over a century and an instituion that had been the 5th largest mortgage lender in the UK and much admired for it’s profitability became a symbol of the credit crisis that was to follow. As Bernadette Bruton, Head of HR Strategy & OD asked the session yesterday, who remembers this photo? 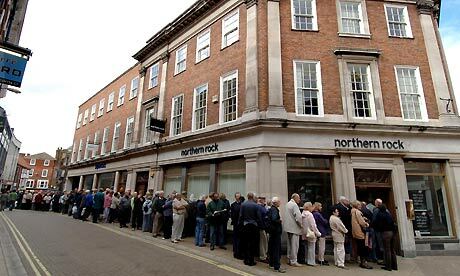 What I hadn’t really considered until listening to the session yesterday was the people who were actually part of Northern Rock. 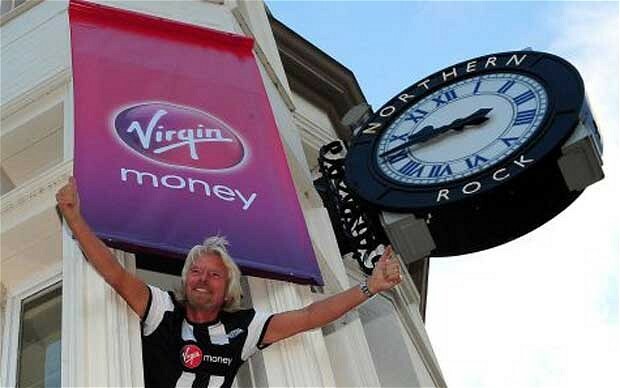 Not the board of directors or the people responsible for the bank’s capital strategy but the thousands of other people who were part of an employer who was much respected in the North East and how it impacted the pride they had felt in being part of that organisation. What has followed since has been inevitable headcount reductions on a massive scale and restructuring the bank not just at a corporate level (the ‘good bank’ and the ‘bad bank’ being now seperate legal entities) but also in how you continue to operate what remains following the maelstrom that must have followed behind the headlines. It was interesting to see Burke & Litwin’s model for OD (1992) being part of the process of providing clarity but also the realisation that despite the external factors at play (you know Lehmans, offshore vehicles, sub-prime etc) there were issues both in culture and structure (e.g. too wide a span of control and too many layers of management) that needed to be resolved if the bank were to move forward. From the sound of things the organisation is moving forward and to the individuals who have lived through the process what follows (in the words of Ms Bruton) not a new chapter but a new story with the purchase of the ‘good bank’ by the bearded wonder Mr Branson. The new story of course involves a whole new set of HR challenges with integrating the existing Virgin Money business with the acquired organisation but what was heartening was hearing of the enthusiasm with which the process has been recieved by the individual employees and the opportunity of giving them something they can yet again be proud of.